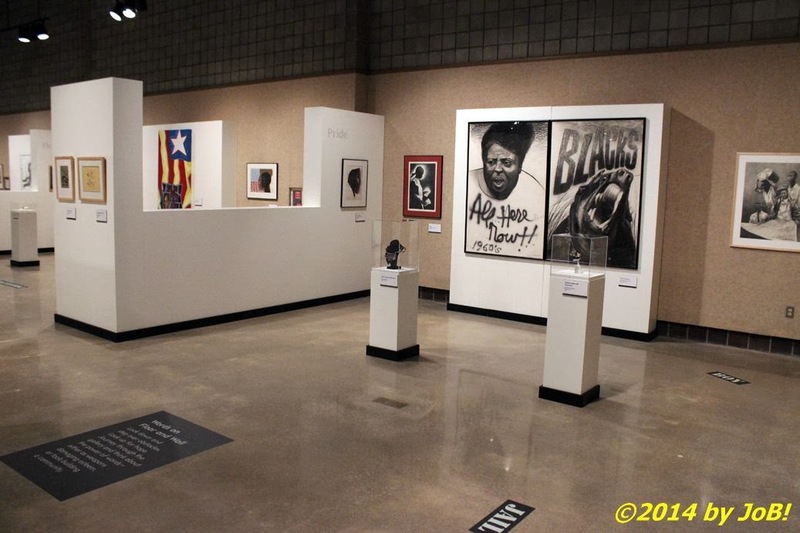 A view inside the "How I Got Over" exhibit at the National Afro-American Museum and Cultural Center's John E. Fleming Gallery. Before walking into the gallery, visitors can read about "overcoming" being a word that describes the African-American experience. Africans were shipped across the Atlantic as cargo. They were stripped of their humanity. Spirituality fostered faith and inspired enslaved men and women to take risky steps that would ultimately help others in the future. African-Americans protested injustices, struggled to make progress, created a new identity, and celebrated their unique heritage. Within the gallery, patrons are asked to expand their field of view when they walk among the items. 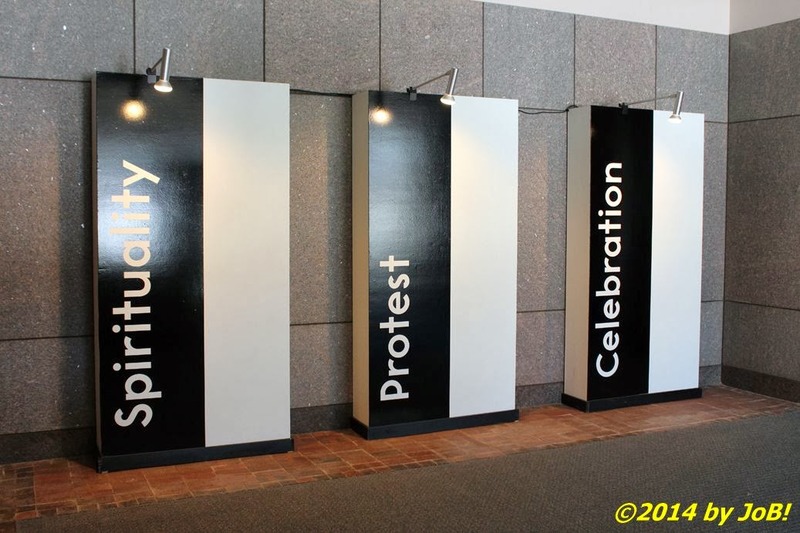 At several locations, words such as "jail", "slavery" and "prejudice" are placed on the floor and serve as reminders of the obstacles African-Americans had to overcome during their time in this country. Other words--hope, heritage, strength--are placed high up on the display walls to serve as tools or goals to use when building the community. 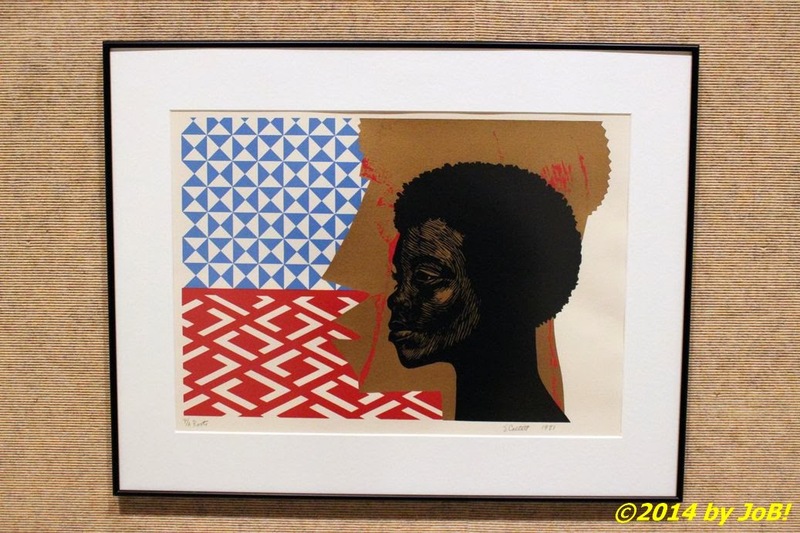 "Roots", a 1981 lithograph by Elizabeth Catlett. The center, located on the campus of Wilberforce's Central State University, was dedicated in April 1988 as the culmination of efforts initiated in the early 1970s by Congressman Clarence "Bud" Brown and Ohio state representative Clarence Josef "C.J." McLin. This census-designated place, named after English statesman and abolitionist William Wilberforce, was determined to be an appropriate location for this venue due to its prominent anti-slavery role during the Civil War (seven stations of the Underground Railroad were located in the surrounding area) as well as its long-term support to two historically black universities. A cotton embroidery dance costume on display. There is currently no posted information concerning the duration length of this exhibit. 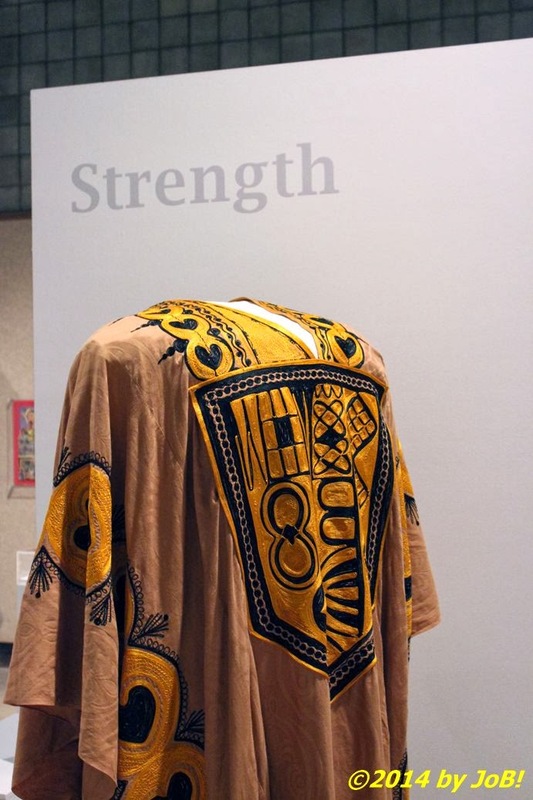 The Afro-American Museum and Cultural Center is located at 1350 Brush Road in Wilberforce--an approximately 20-mile drive from downtown Dayton--and is open Wednesdays through Sundays from 9AM to 4PM. Admission to the facility is $6 for adults, $5 for seniors, and $3 for ages 6-18 and those with a student ID. Children ages 5 and younger as well as Central State University and Wilberforce University students (with school ID) are admitted free.